[Jane Cornwell, second wife of spy writer 'f John le Carré' (David Cornwell).] Two Autograph Cards Signed ('Jane Cornwell.' and 'Jane C.') to Ian McPherson, regarding getting her husband to inscribe one of his books for him. Both cards with letterhead 'From Mrs. David Cornwell', at their London address. 25 April and 25 May 1983. The two cards are accompanied by the envelope in which the first card was sent, with stamp and postmark. All three items in good condition, lightly aged. Envelope addressed to 'Ian McPherson, Esq.' at his house on the Isles of Scilly. Both cards written in blue ink on side with letterhead, the other side being blank. ONE: 25 April 1983. She thanks him for his letter and cheque, adding: 'I have no signed copies at present, and in any case we must wait for my husband's return from a research trip during the next week before I can get him to inscribe it specifically for Andrew'. [Michael Gilbert, crime writer] A large collection of Typed Letters Signed. MICHAEL GILBERT, Detective Story Writer, Founder Member, sometime Membership Secretary, 21 TLSs and TNSs, total 23pp., 8vo and 4to, some with ms. additions, 1955-1960, mainly concerning the financial affairs of the Crime Writers' Association (CWA), the financial consequences of publishing the Anthologies, details of income tax, the Accounts (Income/Expenditure), request for information for tax purposes, the ultimate tax position, sales of the Anthology Choice of Weapons. [Roy Vickers, crime writer] Five Typed Letters Signed and other signed material [T.C.H. Jacobs of the Crime Writers' Association (CWA)]. [Josephine Bell, crime writer] A collection of autograph letters. Detective Story Writer, sometime Chairman of the Crime Writers Association (1959/60). 14 ALSs, TLSs and TNSs, total 17pp., 8vo and 4to, 1958-1960, about CWA affairs - finances, the Dinner (with some incoming correspondence), the Japanese CWA, news from members, meetings, royalties on CWA Anthologies, an agent's malfeasance, a newspaper serial, Lorna Graeme's illness and death (see Bruce Graeme below), Sir Alan Herbert's Literary Project (Public Lending Rights), and the Society of Authors. [Julian Symons, crime writer] A large collection of Typed Letters Signed to [T.C.H. Jacobs of the Crime Writers' Association (CWA). Julian Symons, Detective Story Writer and Historian of the Genre, Founder Member, sometime Chairman of CWA (1958/9), 12 TLSs, one page each, 8vo and 4to, some with ms. additions, concerning CWA affairs - news of the Anthology, financial dealings, expenses, the funeral of a member, the Exhibition, Jacobs election as Vice-Chairman, "Margery Allingham has joined!" (3 April 1959, having declined to do so in 1953), personal, the Awards ceremony, appreciation of congratulations on an award, an "abridged novel venture", a criminal case re-enacted (potential BBC tie-up). [Bruce Graeme, crime writer] One Autograph Letter Signed and two Typed Letters Signe to [T.C.H. Jacobs of the CWA]..
BRUCE GRAEME (Graham Montague Jeffries), sometime Chairman (1957/8), author of "Blackshirt", etc., one ALS and 2 TLSs, one page each, 8vo, 1957-1959, concerning Crime Writers' Association (CWA) affairs - tax affairs, entertainment expenses - and a description of his wife, Lorna's, serious illness and the problems it creates. Two completed standard membership forms for the Crime Writers Association (of Great Britain). Detective Story Writing Team. Manfred B. Lee, typed, 16 Sept. 1957,with minor ms. additions and Frederic Dannay, handwritten, 12 Sept. 1957, both adding a note concerning co-authorship, typed and handwritten respectively. The additions and changes include excising the membership fee in sterling and adding $3 [? ], and both asterisk their names and add at the foot of the page (typed and handwritten respectively) "co-author with . . . under pseudonym of "Ellery Queen". The Crime Writers Association printed form includes a brief history of the Association and terms of membership. Autograph itemised Receipt Signed by the Southwark stationer John Muggeridge, made out to 'Mr. Cromp' and listing five purchases including ink, blotting paper, wax and quills. [Borough (Southwark), London.] 21 February 1777. 1p., 12mo. In good condition, on lightly-aged paper. Headed 'Mr. Cromp 21 Feby 1777 | Bought of John Muggeridge'. The first and most expensive of the six items, at £1 6s 0d, is 'a Book 6 qn fine Medium ruld. 9 lines Vellum <?> lind marbled & Alphabet'. Other items include '1/2 pind red Ink & Stone bottle', 'blotting paper', '1/2 pound supfine [sic] wax' and '400 best Quills'. The six items total £1 14s 6d. Docketed 'No. Manuscript account book of an East London sign painter: 'F. J. L. Foot | Ledger & Journal | Business Commencing | Aug 27th 1934'. Dating from 27 August 1934 to 9 September 1937. 286pp., foolscap 8vo, with 143 numbered double-page spreads. In sturdy ruled account book with stamp of the London stationers Parnell & Co. Very good, on lightly-aged paper, in worn black-cloth binding. Each entry gives the name and address of the business for which the work was done, with details of the job including the dimensions of the letters, and cost. Although some work is done in central London (Bedford College, Regent's Park), most is for firms in the E17 (Walthamstow) and E18 (Woodford) postcodes, suggesting Foot's location in the same neighbourhood. 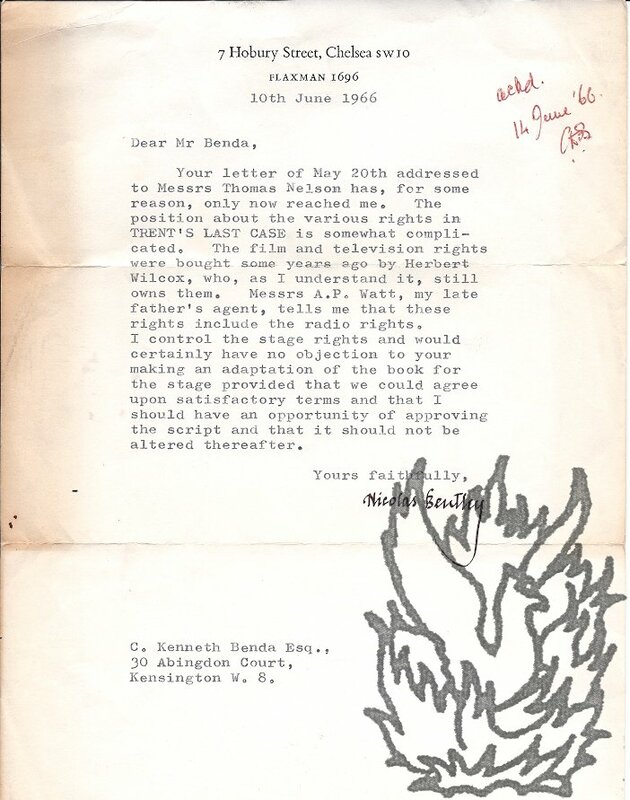 Typed Letter Signed by Nicolas Bentley to the actor C. Kenneth Benda, concerning the rights to his book 'Trent's Last Case', and a proposal by Benda for a stage adaptation. 10 June 1966; on Bentley's letterhead, 7 Hobury Street, Chelsea. 4to, 1 p. 19 lines. Text clear and complete. On aged and lightly creased paper, with strip of sunning to left-hand margin. Neat signature: 'Nicolas Bentley'. The film and television rights to the book were all 'bought some years ago by Herbert Wilcox, who, as I understand it, still owns them'. 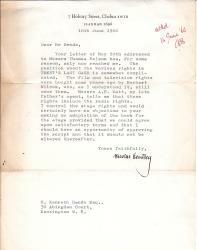 Bentley has reports the opinion of 'Messrs A. P. Watt, my late father's agent', on the question of the radio rights. 'I control the stage rights', Bentley states, giving the conditions on which he would agree to a stage adaptation. Undated. 76 Chester Square, London, SW.
On one side of a piece of paper, 18 x 11.5 cm. Very good, on lightly-aged paper, with strip from stub adhering to the blank reverse. Reads 'With our united kind regards, | Believe me | Very sincerely your | C. Emily Blanche Randolph. | 76. Chester Square | S.W.' 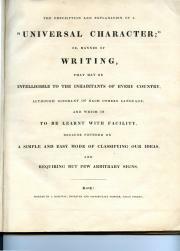 A small square of paper carrying a printed list of twelve of Mrs Randolph's works is tipped in at the foot of the page. Les vacances de Lumineux petit cheval de cirque. Paris: Éditions Émile-Paul Frères, 14 Rue de L'Abbaye, VI. 1955. PRESENTATION COPY: inscribed on half-title 'Pour Louise | avec mon bien amical souvenir - | Cécile Aubry'. 32 pages, quarto. In printed coloured boards, with decorated endpapers. llustrated by Aubry in colour (one double-page and nine full page) and black and white (five vignettes) and red (final page and endpapers). On the poor side of good, with minor staining, spotting and wear; negligible damp damage to boards. 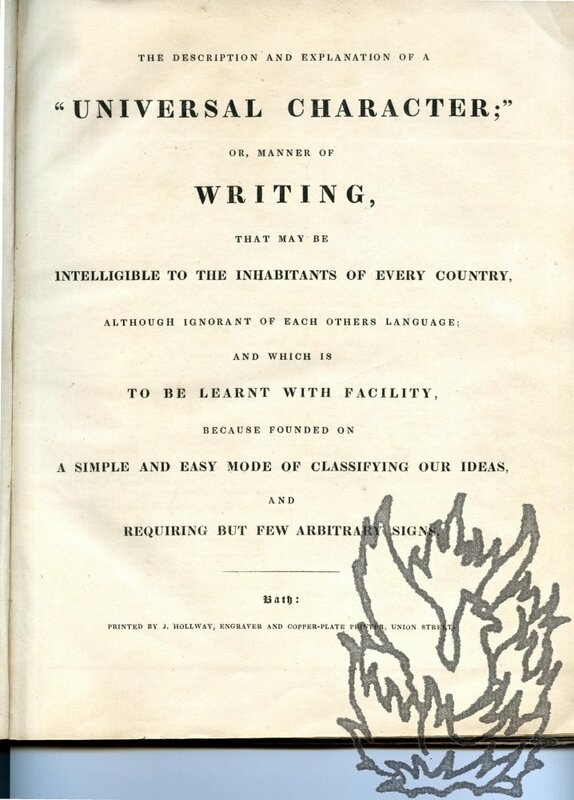 The Description and Explanation of a "Universal Character;" or, Manner of Writing, that may be intelligible to the Inhabitants of every Country, although ignorant of each others Language; and which is to be learnt with facility, [...]. 4to: 48 +  pp of letterpress, with additional leaf after title of 'Errata of Letter Press' and 'Errata in Plates'. Twenty numbered plates (the first two transposed), including one fold-out, and a final seventeen full-page unnumbered plates ('Examples'). Apparently complete. In original brown quarter binding, with cloth spine and paper boards. Ownership inscription of 'Lady Rolle' (1796-1885, born Louisa Barbara Trefusis) on front board. Text clear and complete. On aged and lightly-spotted paper, with wear to extremities and wraps, and cloth spine torn and worn. Autograph Signature on piece of paper. On a piece of wove paper, roughly 5 x 14.5 cm. Rough lower edge. Good, on lightly aged paper. 0.5 cm closed tear at left (not affecting signature). Paper folded once vertically. Good clear signature. Undated and with place not stated. Dimensions of card roughly two inches by three and a half wide. Good clear signature reads simply 'With best wishes | Mazo de la Roche'. Autograph Note Signed ('F. C. Burnand') to unnamed male correspondent. 10 December 1901; place not stated. One page. Dimensions of paper roughly four inches by seven. On piece of aged, stained paper, mounted on piece of card. Remains of biographical cutting in bottom right-hand corner. Reads 'Here you are Sir | Autographs cheap today | F. C. Burnand | F. C. B. | 10 Dec 1901'. Printed Advertisement Leaf advertising Mavor's 'Voyages, Travels, and Discoveries'. Two pages, on leaf roughly eight and a half inches by five. Very good, with three stab holes along one margin. Headed 'NEW COLLECTION OF VOYAGES AND TRAVELS, [...] This Day is published'. Typed Letter Signed to [Morley Stuart, editor of the Cambridge Daily News]. English novelist (1881-1958). One page, roughly six and a half inches by five. Good, but on high-acidity paper discoloured with age. Attached to folio page from cuttings album. She thanks him for 'the cutting from the Cambridge Daily News about your lecture on Cambridge novels, which interested me. I do not suppose I could have said anything useful if you had written to me, as I can never think of anything to say in letters. I was interested in your comparison of Oxford & Cambridge novels.